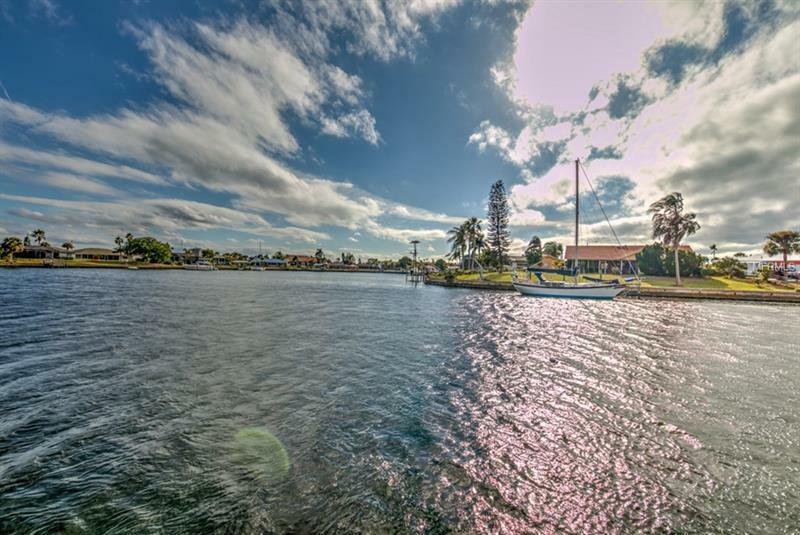 Stunning water views from this top of the line corner unit condo! This lovely two bedroom, two bath home is ready for you to move right in!! Just bring your suitcase, everything else is included! From the covered parking pad in front of your unit, to the boat slip a few steps away from your back door, and everything in between. This ground floor unit is attractively furnished and has windows in each room allowing natural light to come through! The 55+ (but anyone can buy) waterfront condo community of Bal Harbour is located just minutes away to the open bay and Gulf waters beyond! Amenities include a sparkling heated lap pool conveniently across from the unit, and a community dock where you can fish or relax with your favorite beverage while watching the amazing Florida sunsets or stare off into the beautiful water surrounding you. You may even see dolphins and manatees playing in your own backyard. This condo features a living room with extra storage area, dining room with tiled floors, updated kitchen with maple cabinets and granite counter tops, spacious bedrooms with plantation shutters, an open and an enclosed patio with new double pane windows, and a recently replaced air conditioning unit. Take your sailboat or power boat and venture into the waters of Tampa Bay! The carefree Florida lifestyle living is waiting for you! Amenities Additional Fees: Verify with Condo Assoc. or Listing Agent.